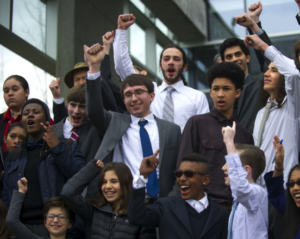 Get inspired by 21 young people, ages 10 to 21, who are suing the federal government for violating their constitutional rights to life, liberty, and property by engaging in actions that cause climate change. Juliana v. United States, supported by Our Children’s Trust and Earth Guardians, has already resulted in a District Court judge declaring, for the first time, that there is a constitutional right to a stable climate. The Court of Appeals for the 9th Circuit will hear oral arguments for the case this Monday, December 11, at 10am in San Francisco, which will determine whether the case goes to trial on February 5. Find out more and livestream the proceedings.